With "Berlin TRIFFT Syria", the new concert series of the Kammersymphonie Berlin opens in 2019, a unique sound experience in which colorful stylistics meets European musical language and the classical modern music of the Orient. In the world premieres of the composers Schalan Alhamwy and Kensaku Shimizu, they experience the current developments in the classical music world of the Far East, as well as the polyphonic music of Johann Sebastian Bach as a context that emphasizes the diversity of cultures. The outstanding musicians Athil Hamdan, Mevan Younes and Maher Mahmoud, who are renowned in their home country Syria, are invited to perform this extraordinary program together with the Kammersymphonie Berlin in the Kammermusiksaal of the Philharmonie Berlin - trendsetting musical paths are developing here, symbolic of the global convergence of cultures! 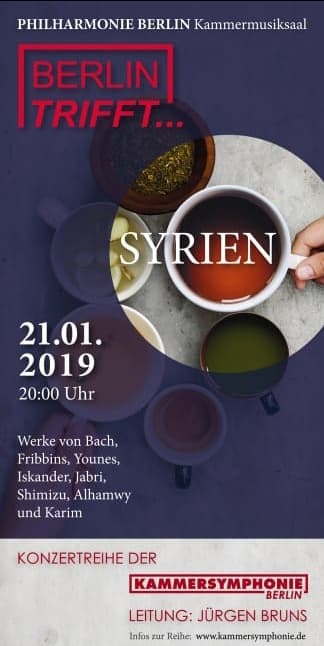 Jürgen Bruns, conductor and artistic director of the orchestra, and Volker Michael of the Deutschlandfunk Kultur - who translates from Arabic - present the talk concert with the Syrian musicians, who provide insights into their individual musical characteristics. This concert is dedicated to the respect of two cultures that approach from both sides and expand horizons through knowledge of current values.